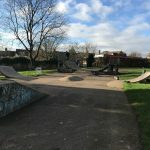 Frome skatepark is a mixture of concrete and skatelite ramps on a concrete base. 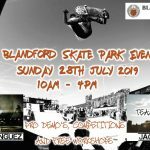 The concrete section is made up of a back and forth run with a flat bank and a quarter pipe either side of a driveway with a hubba and a rail. 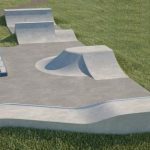 The skatelite section is made up of two spined mini ramps with a roll over between them as well.